This is your chance to race on a stunning, challenging course which takes in the very best of West Cork and the Sheeps Head peninsula. 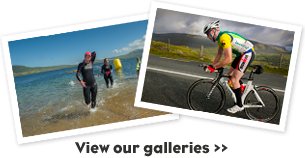 With the start and finish set on the spectacular setting of Bantry airfield you will enjoy a swim in Bantry bay, a cycle through West Cork and the Mizen peninsula before taking in the Sheeps Head peninsula. The run takes you along the Sheeps Head again with the stunning backdrop of the Atlantic ocean for company. The Westlodge Hotel Bantry. Friday from 6-8pm. Saturday from 6.30 to 8am. When is the race briefing? 8.30am on the runway at Bantry Airfield. 6pm in the main bar of the hotel. Do I need a TI license? No. We now carry our own event insurance so a TI license is not a requirement. Thursday the 23rd at midnight or beforehand if sold out.